Apart from the usual chap chye and pongteh, the most important of the laok semayang was the sam seng, which included a large slab of pork belly, a chicken or duck and a fish or cuttlefish, to representative of elements of the sky, the land and the sea. The chicken was either a roast chicken from the hawker stall just downstairs which my grandma pre-ordered a couple of days ahead, or ayam pek sak, which is just a whole chicken cooked plainly in boiling water. After prayers were over, the ayam pek sak was either chopped and eaten as it is with cili chukka, or transformed into ayam char halia or simply chopped and dumped into the pot of kari ayam. The fish, usually ikan kurau or ikan parang, was flaked and transformed into sambal lengkong. 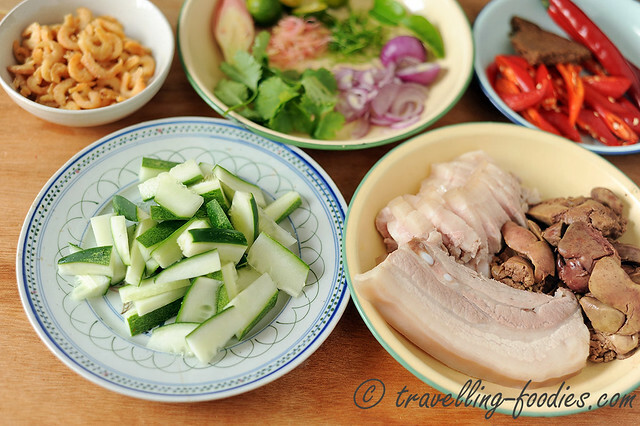 The pork belly was either storebought babi panggang from the same hawker stall as the roast chicken, or simply a large piece of babi pek sak that was after that cooked into either tau yew bak, babi satay, babi assam or simply made into sambal timun. Sambal timun is a simple appetiser which goes really well with the nyonya mah mee aka mee semayang which was cooked specifically for the prayers as well. The contrasting flavours in these two dishes compliment one another perfectly, as if one was evolved for the other. The ingredients are quite a handful yes but the results are highly gratifying making the prep work worth every bit of effort put in. 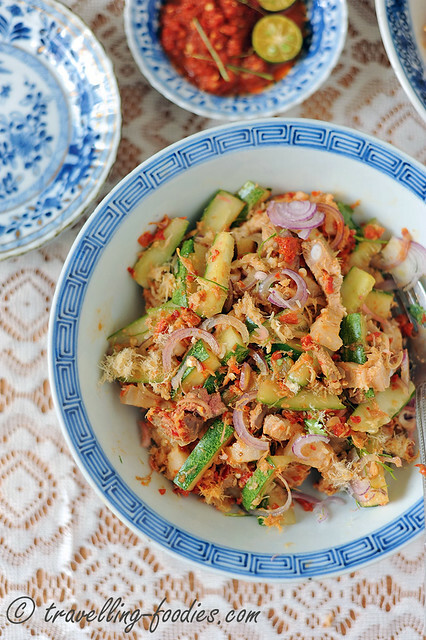 Sambal Timun, resembles a “kerabu” more commonly associated with the Penang Peranakans. 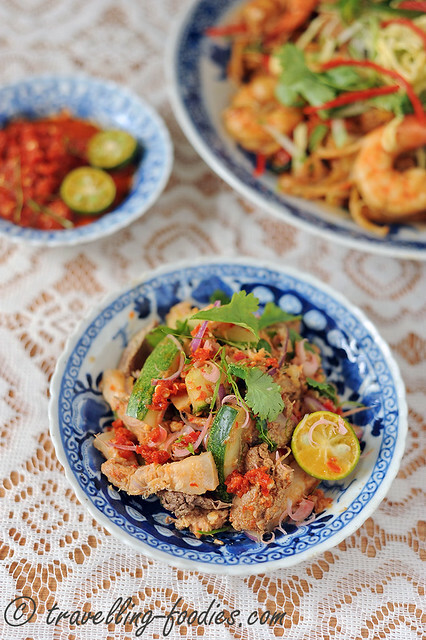 This, with Sambal Jantong Pisang are the two signature dishes in Peranakan cooking. Apart from cucumber and pork belly, we love to put ati ayam, i.e. chicken liver in our sambal timun. I absolutely love chicken liver, especially when it is just cooked, or even very slightly undercooked, still pinkish and very soft. I akin this to the French loving their foie gras but of course, in a much less cruel fashion. In the past, chicken liver was readily available and given free by the poultry sellers which grandma would always request from whenever she did her marketing. Nowadays they are sold separate from the bird itself and it is not easy to find good and fresh ones anymore. Pound or blend chilies with toasted belacan until a coarse paste is obtained. 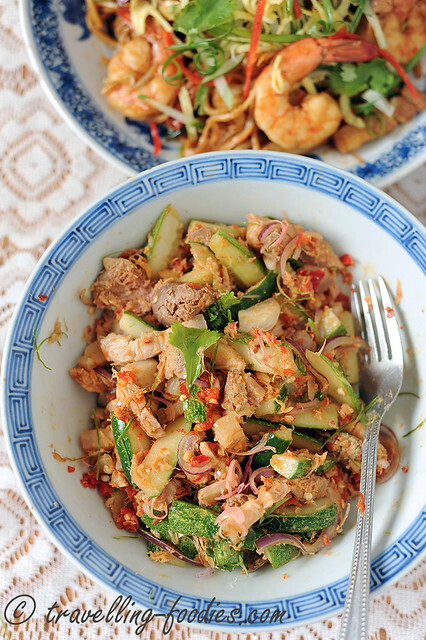 Add flossed dried shrimp, kaffir lime leaves and sugar and continue pounding or blending to homogenise. Add calamansi lime juice and mix well to form sambal belacan. 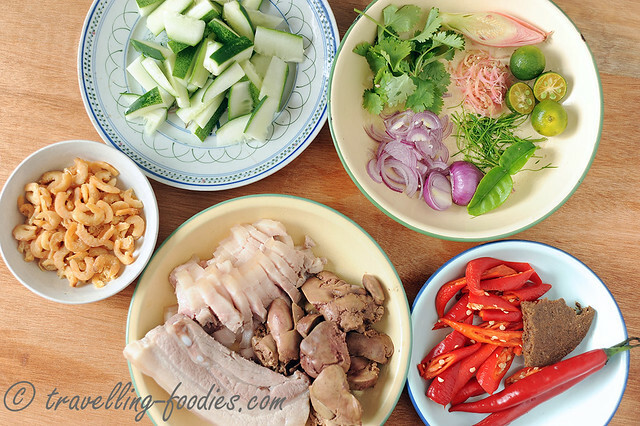 In a large mixing bowl, place pork belly strips, cucumber strips, chicken liver pieces and half of the sliced bunga kantan, coriander leaves, shallots. Pour into the mixing bowl the prepared sambal belacan paste and toss everything well with either a fork or clean hands. Adjust the taste with more salt if required. 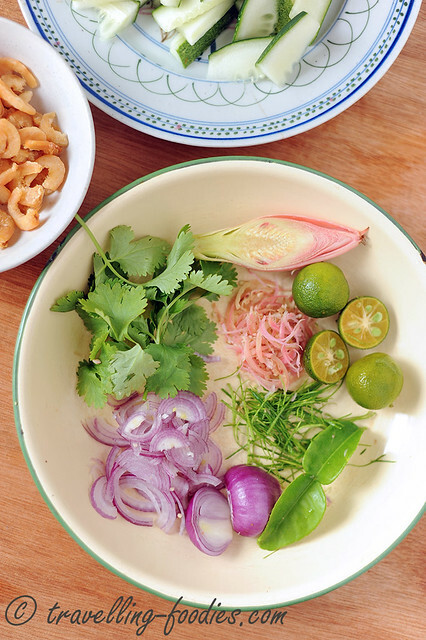 Pour into a serving bowl or dish and sprinkle the remaining sliced bunga kantan, shallots, coriander leaves. 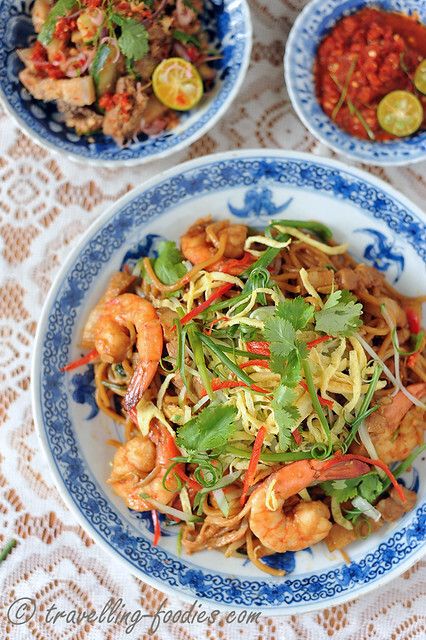 Serve with Nyonya Mah Mee or with other dishes. This entry was posted on September 2, 2015 by Alan (travellingfoodies). It was filed under Food, Simple Eats and was tagged with ati ayam, babi sam cham, bunga kantan, chicken liver, cili idop, cili merah, coriander leaves, cucumber, daon ketumbair, daun ketumbar, limoh katsuri, limoh purot, mee nyonya, Mee semayang, pork belly, red chili, sambal belacan, sambal timun, torch ginger bud, udang kering.